Why should we have a burden for the future of the Jewish people? Nathan Jones: August, everytime I see you I look at your ties and notice they've got the Jewish Star of David or a menorah. Everytime I've run into you, you are wearing something Jewish. Why do you have such a passion for Israel? August Rosado: I have such a burden for the Jewish people just like Paul did when he said in Romans 10:1, "Brethren, my heart's desire and prayer to God for Israel is that they might be saved." That is my burden. The passion of my ministry is to see Jewish people getting saved. We lead a group to Israel every single year. We take Hebrew New Testament Bibles with us and we pass them out on Ben Yehuda Street. They love it! My passion is reaching out to the Jewish people because I love the Jewish roots of my Christian faith. Psalm 122:6 says in the Hebrew, "Sh'aLV ShLVM YUrVShLM," or in English, "Pray for the peace of Jerusalem." And, the only time that Jerusalem will have peace is when the SAHR sha-LOME — the Prince of Peace Himself — comes and reigns bodily for a 1,000 years. When I pray for the peace of Jerusalem, I am praying for the Return of Yeshua the Messiah — Yeshua Hamashiach. Dr. Reagan: You're probably well aware of the fact that the vast majority of Christian denominations both Protestant and Catholic teach that the Church has replaced the Jews and God has no purpose left for the Jewish people. They call the Jews "Christ killers" and say that God has washed His hands of them and that is that. What is your response to their claim? August Rosado: I reject Replacement Theology 100%. It is not biblical and I believe that it is anti-Semitic. Many of our Bible seminaries teach Replacement Theology which teaches that God is done with the Jewish people, that all of the promises that God made to the Jews are now null and void and have been transferred over to the Church, and so that now the Church is the new Israel. If you believe in Replacement Theology, then you better rip Romans 9, 10, and 11 out of your Bible, because as long as Romans 9, 10, and 11 are in your Bible the Jews are still in God's plan. Replacement Theology is nothing more than a false doctrine which it is not substantiated in the Word of God. Dr. Reagan: Well, I tell you, Paul certainly didn't know anything about Replacement Theology. In Romans 11:1 Paul asks, "God has not rejected His people has He?" Well, the Church says, "Yes!" But, Paul says, "May it never be, for I too am an Israelite, a descendent of Abraham of the tribe of Benjamin. God has not rejected His people whom He foreknew." Therefore, there is no reason why those three chapters have to have been the most ignored chapters in the history of Christianity. 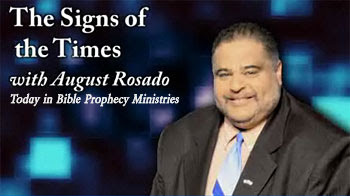 August Rosado: For some reason they ignore Romans 11 as if it doesn't even exist in the Bible. Replacement Theology is a false doctrine. I hate that doctrine. It is not substantiated in the Word of God and I think we ought to reject it 100%. Dr. Reagan: God has a great plan for the Jews in the end times. In fact, He is regathering them from the four corners of the earth for a purpose. August Rosado: That's right! Since 1897, the Jews have been coming back into the land as a fulfillment of Bible prophecy. If you just think that is coincidence, then you have some problems. I don't believe in coincidences. I believe in God-incidence. Amen! In the next part of our interview with August Rosado, we'll ask him two big questions concerning an important promise made to the Jews and discuss if they were responsible for Christ's death. The teaching of prophecy is a contradiction and a threat to the Dogma of the Roman Catholic church. Billy Graham has a crusade and has volunteers from all congregations from across the country to counsel the new babes in Christ who respond to the Gospel message he preaches. 1)Justification by works:Article 135 of the Catholic Catechism says, ‘Faith alone will not save us without good works.’ (to keep salvation). It is essential that the new babes take regular ‘communion’. This doctrine known as transubstantiation was defined by Pope Innocent III in 1215. The new babes in Christ will be told all about the Queen of Heaven who is God’s mother. The Roman Catholic church elevates Mary to the status of ‘mother of God’ (Catechism, Article 167) and ‘Queen of Heaven’ (Article 168a). Although the Catechism does not say she should be worshipped and seen as a mediator along with Jesus Christ, this is the result of this teaching, which can be seen by the size of the images of the Madonna in many Catholic Churches. In other words you are damned and will be excommunicated if you question this doctrine. This means that Mary was a virgin throughout her life, after the birth of the Lord Jesus and was taken supernaturally into heaven at the end of her life. There is currently a campaign within the Catholic Church calling on the Pope to proclaim Mary ‘Co-Redemptrix, Mediatrix and Advocate’ as a dogma of the church. Then the babes in Christ are told about their new Papa – the Pope, the holy father the ‘vicar’ of Christ, God’s representative on earth. The Catechism says: ‘When I say that the Pope is infallible, I mean that the Pope cannot err when, as Shepherd and Teacher of all Christians, he defines a doctrine concerning faith or morals, to be held by the whole church’ (Article 93). The task of interpreting the Word of God authentically has been entrusted solely to the Magisterium of the Church, that is, to the Pope and to the bishops in communion with him.’ (Article 100). The new babes are given further instruction on how to be cleansed from their sins. Article 256 of the Catechism says, ‘Baptism is a Sacrament which cleanses us from original sin, makes us Christians, children of God and members of the Church’ (i.e. a baby becomes a Christian through being baptised). Article 259 says this sacrament is given by pouring water on the head of a child. The new babes in Christ will be given pretty pictures to aid their faith. The new babes in Christ are warned to be regularly cleansed of their sins by confession. Confession is made to a priest instead of to God was made a dogma by Pope Innocent III at the Lateran Council in 1215. Putting the fear of God into the new babes in Christ is for their own good. Purgatory is neither heaven nor hell, but ‘a place where souls suffer for a time after death on account of their sins’ (Catechism, Article 106). It was defined as a dogma at the Council of Florence in 1439. It is said to be as bad as hell, but you are only there for a limited time, not for eternity. Belief in purgatory has been used to persuade people to give money to the church in order to gain relief from time in purgatory. Relatives can purchase ‘indulgencies’ from their Priest who will pray for their dead loved ones to lessen their time in torment. Perhaps a little later, the babes in Christ will be informed of the purity of their new Priests? If YOUR child, as a new babe in Christ, went forward at the Salvation call at a Billy Graham crusade and learned their new faith at the knee of a Roman Catholic Priest or Nun; would you be pleased for them? Most Christians in the UK are ignorant of the errors of Catholic doctrine and not really bothered about them either. They say, ‘Let’s get together to save the world and not worry about what we actually believe and teach.’ But the Bible shows us that it does matter what we believe and that only the Lord Jesus coming again in power and glory can save the world. Therefore we should be true to Him even if we are a minority in society and in the professing church. In the last days there will be a one world religious system which will be allied to the one world government of antichrist but will eventually be destroyed by him (Revelation 17). As we see the growing apostasy of the visible churches, the Lord is calling for a faithful remnant who will ‘contend earnestly for the faith once delivered to the saints’ (Jude 3) which is given to us in the New Testament by the Apostles. As we get nearer to the Lord’s return we should expect to see a growing hostility to this remnant by both secular and religious powers. Examples of this happening are shown in an article by Roger Oakland entitled ‘Evangelicals and Catholics Together and the Rejection of End-Time Christians’. Taken from an article "Canterbury, Rome and Jerusalem" by Tony Pearce of “Light for the Last Days” London. Now standing at (but now seem to have finished) 46 comments. Sue (within those 46 comments) you mentioned about a united faiths meeting held by the Pope a number of years ago. I found the Ississi meeting you were referring to. It took place in 1986 by the previous Pope. Very interestingly the new Pope wants to celebrate that meeting of 25 years ago by reconstructing another one (also in Assissi)which will take place later this year in October. I think this is very significant - much more so than in 1986 because much of todays Protestant and evangelical wing of Christianity has returned (in ecumenism) to Rome through a multiplicity of networked movements including Purpose Driven, Emergent church, Alpha, Promise Keepers, Latter Rain and NAR etc. We have also in recent years seen the speedy emergence of all faiths dialogue through the working together of people like Tony Blair and Rick Warren. Maybe, the meeting in October will be the next stepping stone culminating in Babylon the Great global religion, which was prophesied in the Book of Revelation. sorry "ississi" should read "assissi"
I made this point a long time ago and have not found this perspective considered in any commentaries on Romans. Most scholars address Rom. 9-11 as an "insertion" [..there is another 'lawyerese' word that I've heard them use, that I'm trying to recall, not intercalation or addendum, but something along those lines..], parentheses, or digression, that deals with the sovereignty of God. They don't seem to consider that there aren't chapter divisions in the originals. He is addressing the whole Roman world in essence and he has anticipated the skeptical, side-long glance of the average Roman. After all, by this time there were enough Christians around, witnessing about a Jewish miracle-worker who was crucified and supposedly resurrected back to life, for Rome to take notice of. A Roman would look at him and say: "This Jewish God was supposed to deliver them from Rome and promote them to a position of sovereignty over the world and they killed their Messiah and now look where that got them ... Their God apparently hasn't done anything further with them, they're still just a bothersome, nothing nation." "Now, if I trust this Jewish Jesus Messiah, what's to keep this God from losing interest and dumping me if I can't be 100% faithful, after all, I'm not real good with keeping up with all this religious stuff." Paul is emphasizing the absolute security of the believer [in the long version of Ch8] by saying "there is no future event that can happen to you, no future thing that you can ever do that can separate you from the salvation that God has promised and freely given you, and here's the proof-example of His Word:"
The good news is that I finally got my jee-male and b_logger ID restored soz I can access it again [after over a month]. The bad news is that I had to capitulate and give them 1 of my other alternate emell accounts. As I mentioned on another site: "They have been pestering me for the past 2months about "if you lose your account we need a mobile # or an alt email to send you a password reset", and I have been ignoring them and blowing past that page. I don't want the mobile service and they don't need to link any other accounts that I may or may not have." "...and right after I sent the eemell 2 EI "they" had been making me put my password in a 2nd time like clock-work 4 no good reason [I wunder if they didn't like what I sent, my concern about da BadO pretenderdude pulling the plug on the net]." "...and "they" won't let me sign back in without giving them a phone# or an alternate email account, saying "there's been some 'suspicious' activity on your account lately". EI, I finally got to see yer email from a month ago - will respond a little later. Mary is the "Mother of God" or Theotokos in Greek. Mary is the mother of Jesus and Jesus is God. The Bible NEVER used that term "mother of God" for Mary. However, mother of God or Queen of Heaven were terms used in Babylonic religion for their goddess and was reintroduced by the Catholic church into Christianity. By calling Mary "mother of God" we are giving her a title NEVER intended in the Bible which implies she had some form of divinity, which she didn't have and it elevates her to a much higher place than that of a mere mortal. Mary was the biological mother of Jesus being responsible for the Word becoming "flesh" but not responsible for Jesus becoming God. Jesus has existed throughout time. John 1:3 and John 1:10 states that "The Word" ie Jesus was in the beginning involved in the creation of the World. Mary was simply the human tool God used to create a temple (body) for the Word to live amongst us. Jesus never acknowledged Mary in any divine way, neither should we. She was simply a blessed woman chosen by God to be an instrument bringing the human side of Jesus into the world. She is no greater than any other disciple. Matthew 11:11 "Truly I tell you, among those born of women there has not risen anyone greater than John the Baptist; yet whoever is least in the kingdom of heaven is greater than he". Mary was born of women too, obviously, so Jesus is clearly saying that those who are humble servants of Jesus are greater than Mary, isn't he?